This past Sunday, It had been a long but good week, and our church is a 45 minute drive away, so God and I decided to stay home. Turning on the TV to watch a little NFL football, I discovered that I didn't have to leave to go to church. Church came to me. Welcome to the United Church of the NFL. After reading this post I hope that you will come away challenged to live more courageously, and to care about and work for what matters. Across the league teams chose to protest during the national anthem. Some sat, some kneeled, others raised fists, while still others locked arms or held hands. A few teams decided to stay in the locker room or tunnel until the anthem was over. This was not a protest against our flag or a sign of disrespect towards all who have served or are serving this beautiful, broken country of ours. It was not done in an effort to undermine the ultimate sacrifice that countless members of our military have made throughout our history. In fact, quite the opposite. The players were calling us to a higher standard for which those sacrifices were made. The were calling our entire country to a higher standard, us as individuals to a higher standard, and, they were calling the leader of this great country to a higher standard. A standard that should reflect what this country claims to stand for when we raise the American flag high in the air. The claim that all are created equal and deserving of life, liberty and the pursuit of happiness, not to mention deserving of respect, dignity, compassion, and for God's sake, common human decency and kindness. And since it starts at the top, our leader should lead the way, should set the highest of high standards. Unfortunately, thus far, he has not, did not, and is not. His bar has been set ever lower, as demonstrated by yet another divisive tweet from the man elected to lead our country. A tweet that demanded some kind of appropriate response from players and coaches alike. 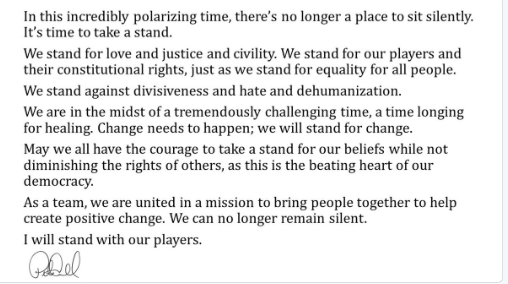 Pete Carroll, head coach of the Seattle Seahawks, as a true leader does, chose to "go high" in his response, speaking truth to his power in a tweet of his own.